Why Bablic Is The Ultimate International SEO Solution? Have you ever tried working on International SEO on your own? If so, you probably know how difficult, confusing and frustrating it can be.. Getting ranked in just one country is hard enough, how can I handle multiple countries? On the other hand, adding languages to your website is a great way to gain visibility on international search engines. As search engines focus on providing relevant and local results to users, they will privilege websites offering content in the local language. If your website's content is translated properly there are much higher chances of it appearing in the local search results. Needless to say, localizing for SEO purposes requires attention to details. It is crucial to make sure unique URLs exist for each page and for each language, hreflang tags have to be placed correctly and the site map and meta content should be updated. Obviously the quality of the translation is very important, as quality content is the pillar of good SEO results. There are almost endless professional opinions out there, and while you are trying to figure out which one to follow, you have an online business to run. Trying to get all the right answers - and quickly - is extremely difficult. So what should you do? You obviously want to attract global visitors and grow your international audience - but is there a way to simplify the process? Many businesses have succeeded by simply hiring a localization expert, an SEO professional specializing in international SEO, or even by using a combination of a “do-it-yourself” approach combined with a variety of SEO tools. This could work, but there are a few things you should know before you start paying hefty fees to international SEO experts, or wasting money on a bunch of tools you don’t really have the time to use anyway. Make sure you don’t duplicate your site’s content and pass it to another domain or subdomain. It doesn’t have any advantage, and the domains will cannibalize each other’s traffic.You can dominate search engines using a single domain. This does not mean that multiple domains are bad for you. It’s just means you’ll have to build authority for multiple sites. It’s doable, but hard..
Don’t worry about your site’s structure too much. You can set up subdomains, subdirectories or even unique domains for the different countries. All options work well, just make sure you choose one approach and stick with it. Yes, there are advantages and disadvantages to each approach so if this is an important issue for you, you should do some additional research before making a decision. Ensure your international SEO has its own unique character. Don’t hurry to copy other high-ranking websites. Most of the times someone else’s strategy won’t fit your long term business goals. Any good SEO expert will advise you to make sure you use a unique URL for each language. Moreover, Google itself recommends using this approach which is always a good indication. What is Bablic’s solution for SEO? With Bablic you can take care of all your international SEO needs with just 1 line of code. We know very well how difficult it is to reach global exposure in search results. For this reason we made sure our platform helps all online businesses to easily position their websites in every local search provider with minimal effort. In other words, Bablic will not only translate and localize your entire site, but will also provide all the necessary tools that will help you improve your website’s ranking in any market and in any language you choose. If you are wondering whether Bablic is compatible with the web-building platform or technology your site is built on, don’t worry. Bablic works with any platform or technology. Among others, we fully support Wordpress, Shopify, Magento, Weebly, PrestaShop, SquareSpace, WooCommrece, Big Cartel, Bigcommerce and many more. 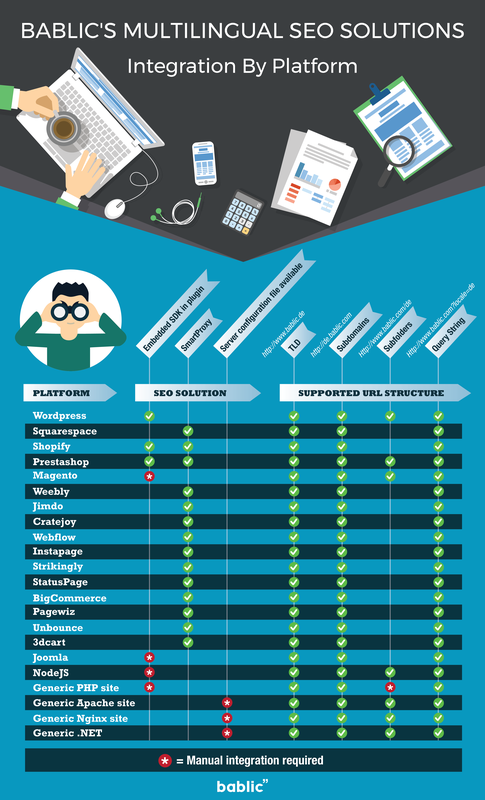 We even support landing page builders like Unbounce & Instapage. You can see our full list of integrations here. What types of SEO solutions does Bablic offer? How does Bablic work with SEO? Bablic offers different solutions for SEO to ensure compatibility with different web-building platforms and technologies. If you built your website from scratch you have access to your server. In this case you can install a simple SDK (What is an SDK? read here) that allows Bablic to interact with your content and with your domain and URL structures. By doing so Bablic will create a fully SEO-friendly version of your website (including content, URL structure etc.) that will be easily indexed by all search engines in every country you operate in. Server access is most likely available if your website was built on one of the more advanced CMS platforms like Drupal, Magento, WordPress, Joomla, PrestaShop, Laravel or Woocommerce. If your site was built using one of these platforms you will be able to install Bablic’s SDK and enjoy excellent indexing by search engines. There are some other cases in which you will NOT have access to your server. Platforms like Weebly, Squarespace and others are built to be user-friendly and easy to use, so in order to make things less complicated they do not allow direct access to the server. Worry not, we have a solution for these as well. The alternative solution for those sites that cannot use our SDK is called SmartProxy, and it is based on Reverse Proxy technology (What is a Reverse Proxy? read here). SmartProxy will welcome every request coming from search engines and will take care of serving the most clear and indexable content directly to them. Setting up SmartProxy is extremely easy. All you have to do is change your DNS settings and point your domain to Bablic’s proxy servers. This way, Bablic will be able to make your website fully SEO friendly, including indexable content and URL structure. The end result is just as good as with the SDK. How do I know which solution is the right one for me? The general rule is simple: if you need to install your website platform on your own server then you definitely have server-side access. In this case our SDK solution will fit your needs best. On the other hand, if you work on your site through an online application (SquareSpace, Weebly etc.) you DO NOT have server side access, and you will need to use our SmartProxy solution. Again, in both cases Bablic got you covered! Now that you are aware of all the important points concerning international SEO, and how Bablic can help make it all super easy, you are ready to get started!. If you have any questions don’t hesitate to get in touch. We will make sure you pick the right SEO solution for you and, if needed, we will also help you set it up on your website. Bablic can help you grow your business globally without struggling with SEO. We will guide you through the set-up of these solutions with simple, easy to understand instructions and you won’t have to feel lost or overwhelmed. Now that we covered it all, enough reading! It’s time to translate your website and start acquiring customers globally.